Please Note: The Strobe Light is mounted above the cabinet in the Recessed and Semi-Recessed Options. 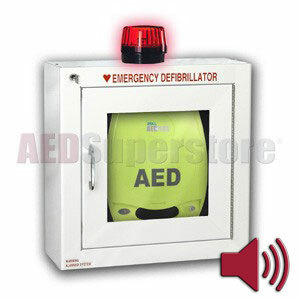 AED shown in picture is not included. ZOLL® AED Plus® Standard Size Cabinet with Audible Alarm and Strobe Light. This surface-mount cabinet contains a bracket exclusively for use of the ZOLL AED Plus model defibrillator. Door-activated alarm and flashing strobe light that alert everyone the AED has been deployed for rescue. Strobe light adds 3" to cabinet height. Very clean and professional looking. Just big enough for the AED unit. I'll only give 4 stars because I thought it was a little pricey. Other than that, very nice, sturdy and an easy install. Missing keys. Were replaced immediately.